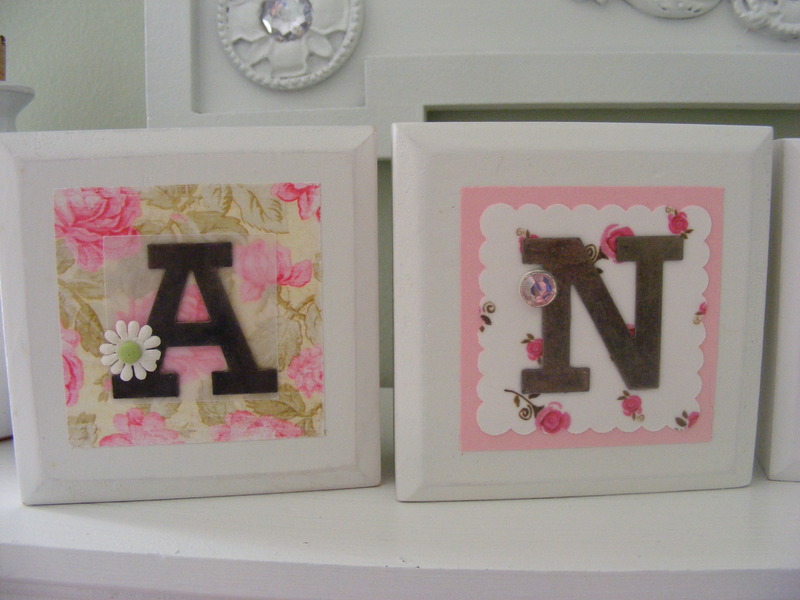 I scrapped these cute wooden blocks for my daughter, Anne. 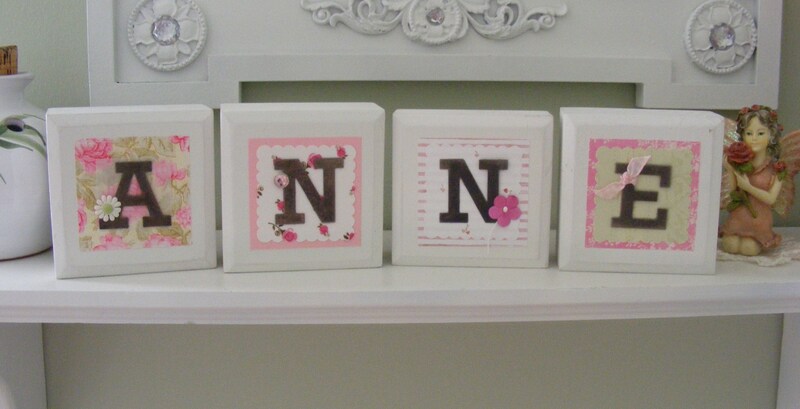 She loves playing with building blocks and I thought these would be perfect for her room, which is pink, green and white. They measure 3 x 3 inches and are 1-1/2 inches thick with beveled edges. I got them from the Oriental Trading Company scrapbook catalog. They were very reasonably priced and came in a package of 6. I started off by spray painting them white. I then pulled out a variety of odds and ends cardstock scraps that matched her room colors. Each cardstock base measures 2-1/8 x 2-1/8 inch. I then used a 1-7/8 scallop square punch to make the next layer, except for the A. I used a 1-3/8 square punch to punch the piece of vellum. I centered and adhered all the cardstock layers on to the blocks using YES paste (the best stuff 🙂 ). I then used the Pewter Press Metal Alphabet from The Angel Company to spell out “Anne”. I also adhered them to the blocks with YES paste. I then used Princess Brads, Tropical Mini Brads, Paper Posies and Mimi Ribbon from The Angel Company for final embellishments. Annie does love them. It has been hard keeping her from using them in her construction projects. 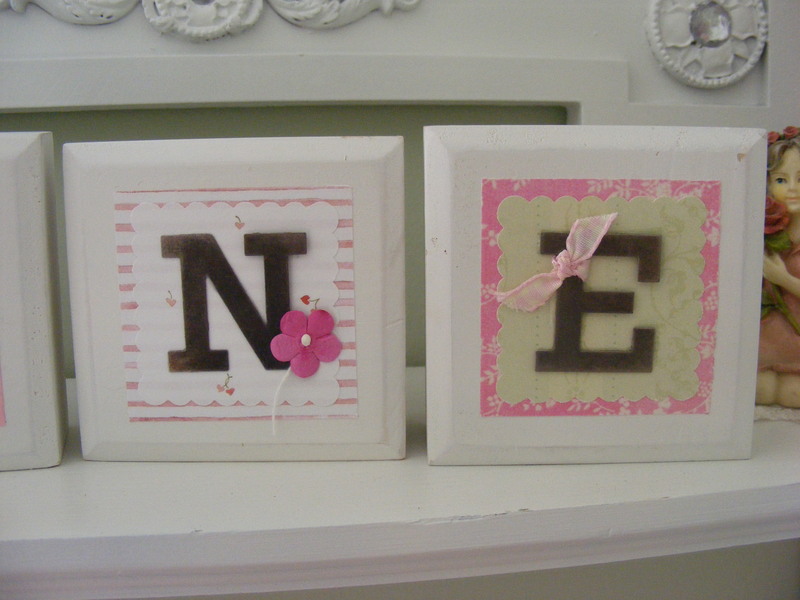 This entry was posted in Room Decor, Rubber Stamped Items and tagged baby blocks, Paper Arts, Paper Crafts, scrapbooking. Bookmark the permalink.